that truly IS a bummer! maybe you can find another amazing tv show that wants to shoot in Hawaii?? I like Rainbows. You are just going to leave temporarily. Once the 'aina has hold of you... it will never let you go. did you guys ever consider staying there? awwwwwe... sad! well, you don't have to leave! :) that is a nice pic of the rainbow breaking thru the dark clouds! I wish my drive looked like this. Fantastic view.I wish I could be there. You're terribly right Jorge! Rainbows are the things I miss more about hawaii.. like Iz said, you're so lucky to be there..
Wow.... Have you caught that pesky Leprechan yet? Sir, don't take a single moment for granted. Absolutely gorgeous! I wish my commute looked like that. Spectacular! I suppose it is the geography, but I have never seen a rainbow so low and wide before! Thank you both for sharing a little bit of your lives. When you see that on the way in, are you ever tempted to play hookey that day? Or would that mean Hurley would surely end up as a light snack for Smokey in the next episode? Beautiful. My 6 yr old loves, loves, loves to see rainbows and always wants to find the end. Do you already know what's coming up next for you? Wow, that's gorgeous. I don't know that I could leave there. It's so pretty everywhere you look! That is absolutely GORGEOUS! I'd miss the view too! Can't argue with you there. beautiful! Wow, that's an awesome picture. I thought you were using DIQUS? That's gorgeous. I shouldn't complain about my one mile commute... but it sure doesn't look like that! Why leave, where could you go that's better? If possible, you should have a home/apartment there so you can come back to the rainbows. It's a double! SOoooo pretty. I want to go to Hawaii some day. I didn't even think about the effect the ending of the show would have on where you'd live. I guess it's unusual for a prime time show to be filmed in Hawaii. However, there are plenty filmed here in Vancouver. It's gorgeous here, though it's kinda more rain than rainbows. Aww! You two don't plan on staying there after? Whatever will happen to our beloved Dispatches from the Island? YO VOTO PORQUE HUGO SEA EL ELEGIDO!!! HUGO RULES DUDE!!! You should stay out there or keep your rental house so you can visit or have long weekends. Oooh it's a double! Nice. I'd miss it too! Bonito arco iris, pero seguro que tambien surgirán alla donde vayas. Aqui en España ya lo podrás observar, yo te invito a que vengas, podriamos disfrutar de esos arco iris. Pero Hawaii es un sitio especial, entiendo perfectamente lo que quieres decir. You should tell your agent to get you a recurring role on the new Hawaii Five-O. Wait, why would you ever leave that place? Cuz of work? I'll write a pilot and come live out there too. you can be my main character! ... I love Hawai'i's rainbows. I saw three of them right next to each other over the Napali coast once. Stunning. Dude that is one pretty awesome commute! I'm a little jealous. Roadkill and bad drivers are all I tend to see on my commute to work. I have some nice photos from the Sunset on the Beach premier, and of me and you on screen in LA X 2. Is it possible to post photos on your blog? You & Beth will be missed when you leave! Visit often! What a perfect rainbow!!! It seems like you finally could find a gold pot at the end of it!! We will miss YOU - maybe a spin off - with you as the star character???? Hmmmm!! What are you going to call your blog after you leave Hawaii? 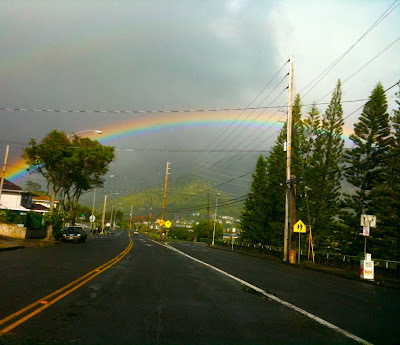 When, I look on this Image, I remeber great hawaii's song by Israel" Over the rainbow ", - my favorite!!!!! Jorge, it's so interesting, when you will move away from the island, you will change name of your blog??? And we'll miss you sir. Don't know what we'll do without our Hurley fix. please watch Jorge!!!!! It would mean a lot! Thats so beautiful! Pretty colours. It's beautiful! I'm coming to Hawaii in a few weeks, I can't wait to see what the island has to offer. LOL! That sounded a little Lostish. Not intended! I'm glad you're savoring the moments. I've had a couple commutes this past month that looked just like this. Are you going to continue blogging?? Wow, that is an awesomely beautiful view! As far as you leaving Hawaii, that seems really sad as it signals the end of a great TV show. I know I, for one, do not think I will ever find a show as brilliant as LOST. The whole experience has been a blast. Thanks for your part in that. You are an amazing actor and person. While the rainbow is lovely, I was envious of the open, traffic-free road ahead. I think I would miss that the most! So Jorge, are you going to be continuing this blog now that your tour of duty on the island is wrapping up? I've only recently discovered your efforts here, and man, it's been a good time. Hope you keep after it! hawaii 5-0 totally needs a sub-plot about how the detectives go to the island to solve cases. like you guys are their oracle or something. This is very dreamlike, rainbows are beautiful. I would be sad to leave too. Enjoy it while you're there! Will ya miss the RATS!? What a beautiful picture! So cool! I've been seeing a lot of rainbows since my little boy died last August. I always think it's his way of saying "Hi" from heaven. And they always take my breath away. You're so lucky-you had two people saying "hi" to you. We will miss knowing you are here, it has really been a pleasure having the cast get involved with local goings-on, from fundraisers to symphony events to tsunamis...you'll be missed! Look forward to see what you'll be up to next...aloha oi! A personal observation: The thing about leaving is that waking up not being on Oahu just isn't the same. I made the mistake of selling a radio station that I had there a number of years ago and moving back to the mainland to be an "on the road" broadcast consultant and owning a couple of stations and every day I have longed to be back there...Now I able-at last- to be at the point of negotiating to buy another station and finally get myself back there. In the end when all is said and done with modern transportation any of us can live anywhere and get to where we have to be and get back so if you are happy living there -if you will miss the living experience that is Hawaii by all means don't do what I did and consider staying. Amazing view, I love rainbows. I was shaking my head "yes" at the photo of the rainbow, and then laughed to myself about the commute part. I can't believe the traffic on this island. Ridic.